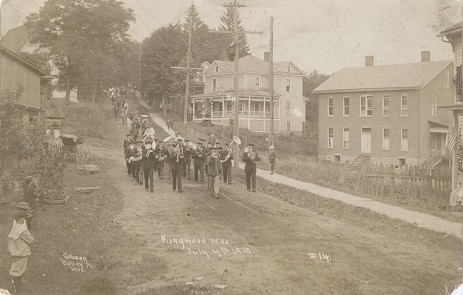 FOURTH OF JULY 1910 -- While schoolboys in knickers watch with reverence, a parade believed to include Civil War veterans makes its way through the unpaved streets of Kingwood, Preston County, WV. One of the old soldiers likely was James Eyster Murdock (1842-1915), who rose from private to brevet captain during the war, saw action in 28 battles and was wounded four times. James served with the 7th West Virginia Infantry, also known as the "Preston Guards." He received wounds in action at the battles of Antietam, Fredericksburg, Spotsylvania and Cold Harbor. At Cold Harbor, he was struck on the top of his head by a sharpshooter's bullet. At Gettysburg, he was in the thickest of the battle defending Little Round Top. And at Williamsburg, he was wounded in the foot, with his name appearing in the May 10, 1862 edition of the Confederate newspaper, The Petersburg Daily Express, Extra edition, reprinted from the Lynchburg Republican. After his wartime service ended, James returned to Kingwood, where he was a teacher and a blacksmith, and married school teacher Martha Ann Basnett (1845-1913). Due to poor health, however, he gave up the physical work and for many years was a clerk in Kingwood dry goods, drug and hardware esbablishments. In the decade before the turn of the 20th century, he helped organize the Soldiers Reunion of Preston County, with one of these gatherings held at Kingwood in August 1891. As a charter member of local Knights of Pythias, he led summer ceremonies of an "imposing procession," reported the Preston County Journal, which "wended its way to the beautiful Kingwood cemetery and remembered the brothers gone before." For several years, James held the office of Adjutant of the local post of the Grand Army of the Republic (GAR), a veterans' organization. He also was township treasurer, postmaster under the first administration of President Grover Cleveland and secretary of the Board of Education of Kingwood for 15 years. James passed away on April 19, 1915. The Journal reported that "Only a short time before [his death], possibly less than an hour, he had been on the street conversing with friends. He had gone home and had lain down on the sofa to rest and about ten minutes before he was found dead he had conversed with members of his family. Shortly before six o'clock his son, James E., Jr., came in and went into the room where he was and spoke to him, and upon getting no response he went to the sofa and discovered that his father was dead." His death was top headline news in the Journal's April 22, 1915 edition. John was the son of John Smart and Rebecca (Miner) Murdock of Kingwood and grandson of Preston County pioneers and flour millers Burket and Frances (Skinner) Minerd who had migrated there at the end of the War of 1812. Mark your calendar -- Our next national reunion of the Minerd-Minard-Miner-Minor family -- devoted to "SELFIES" -- will be held the weekend of June 23-25 at Donegal, PA. Everyone will be engaged in creative selfie-taking and being part of our first-ever, historic national broadcast via Facebook Live. Your best selfie will be uploaded to a reunion selfie collage on award-winning Minerd.com for posterity. You'll have more than your 15 seconds of fame -- your legacy photo will live forever! Depending on the turnout, it may be our last reunion. VisitPITTSBURGH is the promotional sponsor of this page. Be sure to get your copy of the Greater Pittsburgh Convention & Visitors Bureau's Official Visitor's Guide, a 25-page workbook to help event organizers stay on track, no matter what type of reunion or meeting they are planning to hold. The booklet features a page of ideas by the founder of this website, headlined "Take It from a Professional."